While it only makes Top Tourist Destination lists compiled by the most highly informed, the great state of Kentucky is one of those rare places where a visit won’t just guarantee a good time, it’s bound to make you want to move there. From its lush, rolling hills to its music and signature spirit — bourbon — the state, its cities, and its people have a lot to offer, and the autumn months are among its most magical. If you’re looking for a reason to head to the birthplace of Lincoln and Loretta Lynn, here are five other reasons you should travel to Kentucky this fall. Held over the course of three weeks every October and April, the thoroughbred racing at Keeneland takes place in Lexington. In the heart of the Bluegrass, it isn’t just full of the excitement of pounding hooves and the betting of gobs of money, it’s a veritable lesson in Kentucky mythology and culture. Country folk and city folk mingle with blue bloods and the nouveau riche in a way that feels as small town as a local high school football game or church potluck. People dress up, and the facilities are genteel without bring snobby. Especially if you enjoy gambling, now and again, October in Lexington makes for a perfect vacation. 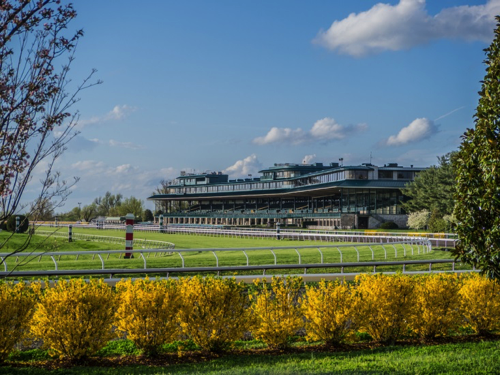 Check out these individual race track profile pages with loads of useful info on Keeneland and other tracks around the country. If you’ve ever wondered if you could orient a vacation around bourbon, Kentucky’s Bourbon Trail is here to offer its resounding, “Yes!” A program started by the Kentucky Distillers’ Association, the trail offers both routing and a rewards program to participants. It also has two distinct branches. The first and main trail includes nine well-known bourbons and distilleries, including Four Roses, Maker’s Mark, and Jim Beam. There is also a “Craft Trail” that includes smaller, more artisan distilleries such as Barrel House, Old Pogue, and Limestone Branch. A small college town just off of I-75, Berea is a hot spot for arts and crafts. The Kentucky Artisan Center is located here, where you can see craftspeople working in everything from quilts to clay. Berea College is a wonder unto itself as well. Founded in 1855, it was, for a long time, the only interracial and co-educational site of higher learning in the Southern United States. Today, it admits only the most promising students — mostly from Appalachia — where they all enjoy a tuition-free education that is offset by working at least 10 hours a week for the college. Another reason to head to Berea? The Pinnacles are there — amazing outcroppings of rock that give hikers a stunning panoramic view of the region, and the autumn color is outstanding. One of the more fascinating religious sects to ever settle and flourish for a time in America, the Shaker Village at Pleasant Hill recounts their culture, religion, and remarkable industry in a unique way: an entirely renovated village. Known for their architecture, music, and craftsmanship, visiting Shaker Village is like stepping back in time into a simpler and more devout way of living. Listen to live Shaker music inside of a beautifully restored meetinghouse. Watch broom makers at their work. Hear detailed talks and lectures about theology and practice. Stay the night and enjoy a meal or two. Take a ride on the Kentucky River beneath the sheer cliffs called palisades. The entire experience is one-of-a-kind, and it’s all set amongst stunning and luscious land where the bird watching and hiking in fall are also top-notch. The longest known cave system in the entire world, Mammoth Cave boasts over 400 miles of explored underground terrain and countless miles that have yet to be discovered and mapped. There are numerous cave tours offered that range in difficulty from simple walking tours to more advanced spelunking endeavors, which makes it a great destination for cave lovers of all kinds. Mammoth Cave is also located in a national park where a host of other great activities can also be enjoyed, including biking, hiking, horseback riding, camping, canoeing, and plenty more. The fall is a great time to visit as the crowds have died down, and the fall foliage is at its peak. Take one of the best vacations of your life this autumn, and head to Kentucky where the land is beautiful, the horses are fast, and the bourbon is everywhere.